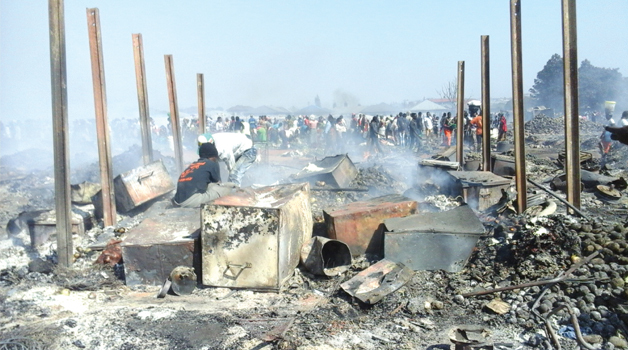 A FIRE has swept through Ndola’s biggest market, leaving precious little to salvage by the thousands of distraught traders who earn a living trading there mostly in foodstuffs, charcoal and second-hand clothes. Police said one man was arrested on suspicion of negligence that is suspected to have triggered the inferno while 12 were held for looting. Another man was said to have suffered burns while attempting to save his merchandise and was being treated at the Ndola Teaching Hospital. “I have lost goods worth more than K150 million. I am just from buying these bags of maize and groundnuts, because I need to raise money for my children’s school fees. I don’t know what to do next,” Barbra Mwenshi, a trader said amid sobs as she pointed to the charred remains of bags. The Kapalala market fire comes less than two months after a huge section of Lusaka’s popular City Market was gutted by a conflagration that forced the displacement of thousands of traders. •Various items were reduced to rubble. Kapalala, covering the size of five football fields, is an extension of the original Main Masala market and popular for vegetables, fish and rice brought in from outside the province and constructed almost entirely of flammable materials; timber, paper, plastic. Such was the ferocity of the blaze, said to have started around 01:00 hours, that only mounds of fresh tomatoes, onions and cabbages, were identifiable amid the smouldering piles of rubble. In the centre of the market, and the charcoal section at the western end, the fire had left large, barren swathes covered in white ash. As armies of traders, mostly women and their children picked through the remains to salvage what they could, a mini-whirlwind did a short dance across the area before dying out. Witnesses who had been at the scene from the moment the fire was spotted said efforts by the fire brigade to quench the fast spreading inferno were hampered by lack of access into the market for the fire tenders. Ndola Mayor Amon Chisenga led Ndola Town Clerk Wisdom Bwalya, Ndola Central Member of Parliament, Emmanuel Mulenga and his Bwana Mkubwa counterpart Jonas Chanda, several councilors and Patriotic Front provincial officials to check on the extent of the damage. Mr Chisenga described the incident as unfortunate and called on all the marketeers to stay calm as the Government was concluding investigations and finding alternative trading places. He tasked the market chairperson and his team to compile an exact number of marketeers affected for ease of identification so they could benefit from whatever support government could arrange. “We are saddened by this unfortunate incident and we are with you. I want the market chairperson and his team to work and ensure that we have the exact number of marketeers affected,” he said. Moffat Mushalula, who lost more than 30 bags of potatoes worth about K16 million and bags of rice worth K9 million, said he had lost all his capital and source of income. He said if the fire had been deliberately started, the people behind the act should be stopped as they were causing suffering among innocent people trying to earn an honest living. “I have lost my property. I sell potatoes and rice and all my property has been burnt to ashes. This was my only source of income,” he said. Copperbelt police Commissioner Charity Katanga, who visited the scene, confirmed the arrest of one person, who had been charged with criminal recklessness and negligence and causing fire, while the 12 were being held for looting. The 30-year-old suspected is expected to appear in court today. She said after visiting the fire scene that she could not disclose the details of the man arrested for fear of exposing him to angry victims. Ms Katanga said it is believed the suspect, who worked in the charcoal section, had left a burning brazier unattended to go and help offload a truck. “We have done our investigations and we have warned, cautioned and officially arrested a 30-year-old man for recklessness and negligence and he will appear in court today. Six witnesses have testified in that regard and the man was brought to the scene this morning and he showed us what transpired. 12 others are being held for looting and will be charged appropriately. They have been detained,” she said.